The author of A Tale Dark and Grimm and the story of how he came to write this book are almost as interesting as the book itself, so what follows is a two part review. Part One, About Adam Gidwitz sheds light on his background as well as the importance of fairy tales and the appropriateness of the violence that is a crucial part of these stories. Part Two is a review of his debut kid's book. I have always loved fairy tales, especially books that take a fairy tale and twist it a bit. In fact, I even went through a brief period of amassing books that approached fairy tales from an academic perspective with an eye to getting a masters in Advanced Fairy Tale Studies. While that might have just been an excuse to buy more books, my interest in fairy tales remains and I was very excited to see the Marjorie Ingall's review in the New York Times from last year titled, When Stories Had Teeth, discussing three new books with fairy tales as pertinent plot points. While all three of the books intrigued me (and will be reviewed on this blog eventually) at the time, A Tale Dark and Grimm by Adam Gidwitz with illustrations by Hugh D'Andrade piqued my interests the least. Ingall described it as a "completely post modern creation" with an "intrusive, Snicket-y narrator who warns the reader every time gore is imminent, apologizing, urging the reader to hustle the little kids out of the room." I was so frustrated and annoyed by the time I finished reading all thirteen books of the Series of Unfortunate Events out loud to my son that I never wanted to read another post modern book with a narrator again. But, this book keeps popping up all over the place and lunch breaks happen. Well, it came out of telling stories—Grimm and others—to my students. When I tell a story, I look into the kids’ faces, I read their reactions. If someone's getting scared, I pull back a bit, shine some humor on what's happening, or give a hint about what will happen. If the kids are getting bored, or overwhelmed with high-falutin' language, I ramp up the tension or the humor. I have this deep and widely derided belief that kids know what they need. Philip Pullman says that kids need stories, for example, and the reason we can’t pull them away from the TV set is that the fastest, easiest ways to get stories is TV. So while we may not want them to watch TV, the children are going after something that they need. I also think children know when something is wrong for them. If you start talking about your tortured relationship with your mother, most seven year olds will tune you out and start thinking about that spaceship they were designing upstairs. Because they feel weird about that conversation. They tend to know what they need, and what they need not to experience. Children above all need parents, and rely on their parents to help them express their needs and aversions. This is crucial. The kind of violence in fairy tales means something to kids—much more so than TV or movie violence; it symbolizes deeper things. Two of the three little pigs getting eaten does not upset most children, because those little pigs grow up, in the child's mind, into the third little pig. The violence is not just appropriate, it is serving the child's emotional needs. I think Bettelheim explains it well. Check it out in my "Warning: Boring" section here. Or read my piece "Tears into Blood." While our society has become increasingly desensitized to violence, we are also whitewashing the kinds of violence, mainly in fairy tales, that helps children make sense of their own feelings and the world around them, creating a schism in understanding on their part. A Tale Dark and Grimm is an important step toward bridging this gap and reintroducing these vital tales to our story hungry children. For a really straightforward, always excellently written review, check out Betsy Bird's review from July, 2010. You might also enjoy a more recent interview with Adam Gidwitz from Bird's blog fuse#8. For something a little more meandering, read on! It will happen to you, dear reader, at some point in your life. You will face a moment very much like the one that Hansel and Gretel are facing now. In this moment, you will look at your parents and realize that-not matter what it sounds like they are saying-they are actually asking you for forgiveness. This is a very painful moment. You see, all your life you've been asking for forgiveness from them. From the age you can talk you are apologizing for breaking this, forgetting that, hitting him, locking her in the garage, and so on. So, having them ask you for forgiveness probably sounds pretty good. But when this moment come, you will probably be in a lot of pain. And you probably will not want to forgive them. Part of growing up and expected in a YA book, but pretty heavy for a kid's book. But, not too heavy. It comes at just the right time in terms of Hansel and Gretel's journey and, as he is wont to do, the narrator lightens the mood in the very next paragraph. But, you have to admire Gidwitz for discussing this so openly in a book that, in a more covert, "Once Upon a Time" sort of way, is telling the same, universal story. In a nutshell, Gidwitz's story follows the twins, Hansel and Gretel, who are first introduced to us as the offspring of the King and the Queen he has sort-of kidnapped as part of the fairy tale, "Faithful Johannes." In this story, the King and Queen are consumed with grief over the disservice they did to their faithful servant, causing him to turn to stone because they were unable to trust him completely. When this statue of Faithful Johannes tells the King that he can return to life if he cuts off the head of his children, the King complies. Johannes returns to life and restores the life of the twins and they kingdom is happy again. Mostly. Later that night, unable to sleep, the twins discuss the day's events. "He cut off our heads to save that ugly old man," Hansel says. "And Mommy was glad he did. Do you think they hate us," Gretel replies. The two decide to run away in search of good parents who will love them, protect them and guide them. They find themselves winding through five other gripping tales, beginning with their own. My favorite tale comes in chapter four, "Brother and Sister," in which the children, abandoning hopes of finding ideal parents, think they have found an idyllic forest to live in. They meet a talking tree who tells them that they are in "Lebenwald, the Wood of Life," and, they can stay if they agree to "take no more than you need. Life here exists in a delicate balance. Do not upset it." Things are good for a while. But, while Gretel participates with the vibrant life all around her by planting seeds and growing a garden, Hansel is exhilarated by the animal life that buzzes around him and finds himself chasing a brown rabbit through the underbrush. Eventually, Hansel cannot stop himself from hunting the animals in the Wood of Life, even though he does not need to eat them to survive and he is upsetting the balance of nature. Gretel watches in anguish as her brother is overcome by his animal nature, chaging into a furry beast. Finally, he is lost to her when a King and his men enter the forest to hunt. Gidwitz tells the story of the brother and sister with such poignance and love that it is heartbreaking. At the same time, I have no doubt that readers will be able to relate to Hansel's lack of impulse control and the beast he becomes. This chapter was so moving to me that I pulled out my Complete Grimm's Fairy tales and read the original story, which only deepened my appreciation for what Gidwitz has done with this book. I think that part of the reason these fairy tales are not read widely anymore is because they are dense and weird and it is hard to see the connections, meanings and metaphors that Gidwitz provides us with so effortlessly and beautifully. Gidwitz guides us through two more truly creepy Grimm stories, and what happens to Hansel and how the twins are reunited is brilliant. Gidwitz brings the reader and Hansel and Gretel home to the broken kingdom of their birth with the creation of a dragon who is terrorizing the countryside. After their trials and travails, the two feel like they are equipped to take on the dragon, despite the fact that adults have been and continue to doubt the ability of children to do anything throughout this book. They devise a plan, but only manage to wound the dragon. Returning home, Gretel sees the truth of the situation and she and Hansel must rise to a final challenge. The book ends magnificently, with Hansel and Gretel telling the stories of their travels to the King and Queen, who actually tell the servants to occupy the growing crowd of subjects gathering outside the caste so that they can devote their full attention to their children. The servants, Jacob and Wilhelm, unsure of how to keep the crowds quiet, form a chain of servants and listen at the door, passing on the story and keeping the subjects (along with a little food) pacified. While it is wonderful to think of these tales being told in this way, especially by the servants Jacob and Wilhelm in the land of Grimm, what I especially love is the way Gidwitz brings his story full circle. In the beginning of the book the narrator is discussing the nature of fairy tales with the reader, explaining how fairy tales have come to be viewed as boring. "You know how it is with stories," the narrator says, "Someone tells a story. Then somebody repeats it and it changes. Someone else repeats it, and it changes again. Then someone's telling it to their kid and taking out all the scary, bloody scenes - in other words, the awesome parts - and the next think you know the story's about an adorable little girl in a red cap, skipping through the forest to take cookies to her granny. And you're so bored you've passed out on the floor." Well, these stories get passed on, both in the book and by Gidwitz himself, and there is nothing boring about them. 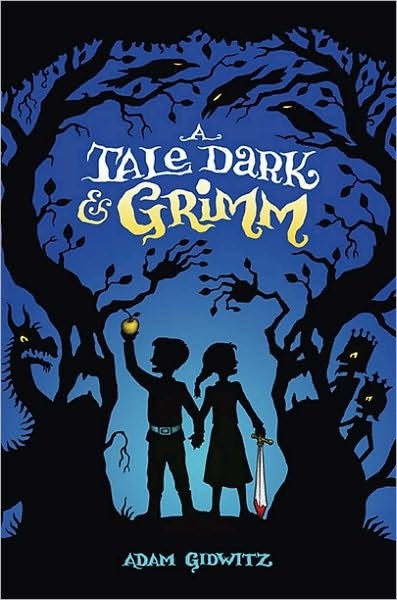 I can't wait to finish the book I am reading out loud to my son right now so that we can dive in to A Tale Dark and Grimm together! One interesting tidbit, in the acknowledgements pages of A Tale Dark and Grimm, Gidwitz thanks his teachers from The Park School in Baltimore, MD, one of whom was Laura Amy Schlitz, winner of the Newbery for Good Masters! Sweet Ladies! Voices from a Medieval Village and one of my favorite books, A Drowned Maiden's Hair. Turns out Ms Schlitz read the English version of A Smile Red as Blood to Gidwitz when he was very young, "thus warping my mind forever!" Good job, Ms Schlitz!